Learning a new language is a fun and challenging feat for students at every level. Perfect for those just starting out or returning to German after some time away, German Essentials For Dummies focuses on core concepts taught (and tested on!) in a typical introductory German course. From adjectives and adverbs to understanding tenses and asking questions, you'll skip the suffering and score high marks at exam time with the help of German Essentials For Dummies. Designed for students (and parents) who want the key concepts and a few examples—without the review, ramp-up, and anecdotal content—German Essentials For Dummies is a perfect solution for exam-cramming, homework help, and reference. 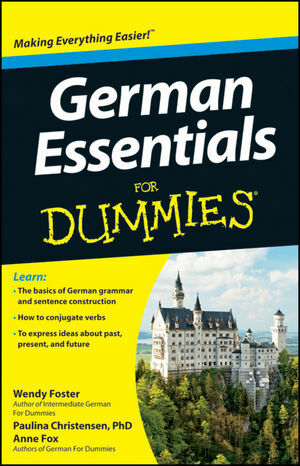 If you have some knowledge of German and want to polish your skills, German Essentials For Dummies focuses on just the core concepts you need to communicate effectively. Wendy Foster has been a teacher, writer, editor, and translator. She is the author of Intermediate German For Dummies. Paulina Christensen, PhD, and Anne Fox are veteran language instructors.